Respected Bhai Sahib Mohinder Singh Ahluwalia, Your Excellency Archbp. Kevin McDonald, Chair, Episcopal Office for Relations with Other Religions, Archbp. Bernard Longley, the Archbp. of Birmingham Archdiocese, distinguished scholars from both the Catholic and Sikh communities, learned speakers and honorable participants of this seminar, warm greetings to all of you. Namaste! 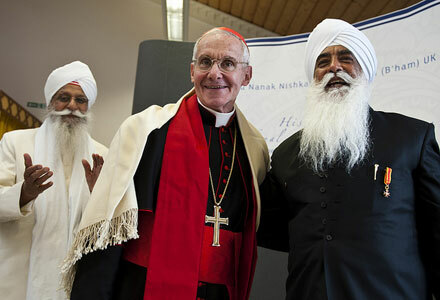 I feel extremely happy to be here with you this day, in the course of my visit to the United Kingdom along with Father Santiago Michael of the Pontifical Council for Interreligious Dialogue (PCID), aimed at promoting, through the local Church, “dialogue of friendship” between the Catholics and the Sikh Diaspora here. The very goal of the PCID, the Office of the Pope for relations with people of other religious traditions, as you may know, is promotion of mutual respect, understanding and collaboration. Since its inception in 1964 as the Secretariat for Non-Christians, it has been zealously engaged in this task encouraging constructive dialogue among people of diverse religions in the world. Dear Sikh friends, my visit to the Gurdwara (Temple) here a while ago, is reminiscent of my visit to the Golden Temple in Amritsar in November 2011. It was a profound experience for which I am grateful to your community. You have accorded us a hearty welcome and I thank you for the same in the name of every one present here. In particular, I wish to express our sincere appreciation and gratitude to His Excellency Archbp. Kevin, his close collaborators Dr. Ryall and Katharina, Bhai Sahib Mohinder Singh and others at the Guru Nanak Nishkham Sewak Jatha for organizing this event. The contact between the Sikh community and the PCID goes back to 1977 when Shri Grucharan Singh Tohra, the then President of the Shiromani Gurdwara Prabandhak Committee (SGPC) invited Pope Paul VI for the four hundredth anniversary of the foundation of Amritsar. Since then, there have been interactions between the PCID and Sikh organizations from India, Europe, USA and Malaysia that includes Guru Nanak Nishkham Sewak Jatha as well. Sikh representatives including Bhai Sahib Mohinder Singh have participated in the Interreligious programmes organized by the Vatican over the years. In November 2011, the PCID organized a Catholic-Sikh seminar at the Guru Nanak Dev University, Amritsar where I too was present. This meeting is therefore one more step in the path of strengthening relationship between both of our communities. Today’s seminar on – Catholics and Sikhs: Service to humanity as a contribution to peace – incidentally is taking place in the premises of an organization whose very name Guru Nanak Sewak Jatha itself speaks for the importance of ‘service’ in Sikhism. Nishkham Sewa, as I am given to understand, means ‘selfless service’, selfless service for altruistic purposes, for the betterment of the society. For Christianity, service is the ultimate act of love, love for God and love for others. Therefore, a reflection on this theme, in view of making contribution to the much-needed peace in the world is not only important but also necessary for both Catholics and Sikhs to serve the humanity together selflessly. Both of our religions, as is evident, lay great emphasis on service to humanity, serving the human being next to us. We, Catholics, find a perfect model for this in Jesus Christ who came “not to be served but to serve others and to give his life as a ransom for many” (Mt 20:28). His entire life was one of service and sacrifice. He said, “If anyone wants to be first, must be the last of all and servant of all” (Mk 9:35). He also said, “The greatest among you shall be your servant” (Mt 23:11). You are familiar with the incident towards the end of his life whereby he washed the feet of his disciples, giving an example of humble service to them and inviting them to do the same. “Whatever you do to the least of my brethren you have done it onto me”. (Mt 25: 40), he said. Following his example, the Catholic Church, for the past many centuries, as you are quite aware of, has been actively engaged, in myriad ways, in humble service to humanity particularly for the poor, the sick, the needy and the marginalized. In your rich tradition too, service – selfless service rendered for the benefit of others is a core concept. It is in fact one of the three fundamental principles of Sikhism (Naam Japna, Kirat Karo and Vand Chakko). We find inspiring lines regarding the same in Guru Granth Sahib, your Sacred Scripture which says, “Centre your awareness on Seva – selfless service – and focus your consciousness on the Word of the Shabad” (Pannaa: 110:1). Bhai Gurdas, the first interpreter of Gurbani wrote: “material, physical service, like providing food or giving rest to the body of the others, or reading out the Scriptures for their solace, is far superior to the countless sacrificial fires and performance of ceremonies or mere meditation and worldly knowledge” (Bhai Gardas, Vars 14, Stanza 19). A concrete and a pre-eminent sign of this spirit of seva is seen in the langar, the free kitchen open to all in the Gurdwaras where every man or woman can find a free meal irrespective of what religion he or she follows, what social status he or she belongs to and wherever they come from. Service and peace, as we know, are interconnected. To serve means to reach out to someone, the needy, in love giving up one’s own personal interests and comforts. One who does so finds joy in giving – giving his time, energy, talents and wealth for the good and happiness of others. The Holy Bible says, “There is more happiness in giving than in receiving” (Acts 20: 35). Unfortunately today in this materialistic and consumerist world, the growing tendency is to receive rather than to give, to amass wealth as much as one can, to climb up the ladder wanting to occupy positions of importance and influence anyhow and by any means at the cost of others. Unbridled egoism, greed and selfishness from the part of some have resulted in inequality, injustice and every sort of exploitation and discrimination of the poor, the underprivileged. As a consequence, there is confusion, conflicts and violence in the society. While just distribution of wealth, equal sharing of natural resources and equal opportunities for all will go a long way in contributing towards a just society, reaching out to the poor, the needy and being of support to them in whatever way we can, will surely contribute towards peace. As believers in our own respective religions that teach us the Fatherhood of God and Brotherhood of all human beings and as persons who have shared values and convictions to contribute towards peace through service, may we Sikhs and Catholics individually and collectively give witness to this noble value of service through words and deeds. The very next day of the inauguration of his Pontificate, Pope Francis while addressing the Representatives of Churches and Ecclesial Communities and of the Different Religions said “There is much that we can do to benefit the poor, the needy and those who suffer, and to favour justice, promote reconciliation and build peace” (20 March 2013). As we engage ourselves in service, through dialogue, in favour of those who are in need and to contribute towards the promotion of peace, we will progress on the way towards Truth, as Pope Benededict XVI underlined in one of his last and most significant discourses. He said, “A dialogue about peace and justice is bound to move beyond the purely pragmatic to become an ethical struggle for the truth […] the search for an answer to a specific question becomes a process in which, through listening to the other, both sides can obtain purification and enrichment. Thus this search can also mean taking common steps towards the one truth, even if the fundamental choices remain unaltered” (Christmas greetings to the members of the Roman Curia, 21 December 2012). I wish for nothing better than this for all of us present here today and for our extended communities.